Sundog Software and X-Aviation have announced work on 'Real Weather Connector', a product to work with SkyMaxx Pro v3. Real Weather Connector will enhance and alter the way weather is generated for X-Plane. Real Weather Connector will be released as its own product, but it will require SkyMaxx Pro v3 to work, utilizing downloaded weather data and generate clouds in their actual locations. To read more about the product, and follow Sundog's development, visit X-Pilot's forum thread. Not going to blame you since they are rather chaotic when it comes to that. http://forums.x-plane.org/index.php?/forums/topic/104744-plus-and-premium-versions/&do=findComment&comment=1064360 That is a post I was referencing to. Hello! So, RealityXP released their GTN750 for 64bit version of X-Plane. As far as I could gather, it's rather very well made product. Now, as far as I know, some developers in "the other sim" allow 3rd party nav aids to be installed into the panels. A very neat thing indeed! So here is my question, I guess to @Goran_M. Are there any plans, or possibility to work on proper GTN750 integration within Citation? Now, I don't mean to sell the plane with GTN as stock, but to have an optional version for the RealityXP's owners that could incorporate the system into 3D cockpit and whatnot. Personally, I think that could be quite benefitial both for customers as well as LES. Morrigan replied to Morrigan's topic in Help!?! That's probably the case, thank you. Morrigan posted a topic in Help!?! Hello! Seems like I am not getting ticket numbers on my email, is it a site wide problem or mine own? Would be wise to leave such claims to the developers, after all it's not your place to call a project you are not in any shape or form involved with dead. Actually, they are pretty active with responses on the other forum. It's still going, not so long ago Kiwi said it's coming a bit slower due to numbers of bugs they are encountering. Hey @JohnMAXX Beautiful as always. It's probably been answered elsewhere, but are you planning on introducing new texture for falling snow as well? SkyMaxx Pro v3.3.2 Has Been Released! Can you guys get back in line with majority of devs around and stop constantly updating and improving your product? Joke, thanks for the tireless work to the entire team. Again. I have updated to the full 10.50 release that was released few days ago. I have other plugins so I will disable them and reenable one by one now, although I do not have the JAR GndHandling plugin you are speaking of. I will promptly report back with some more specific information. Cheers! I must admit I was a little skeptical about improved VAS and performance to the degree that change log listed. I have a preset of a low vis, cloudy weather to practice at a specific airport, and paint me surprised. I actually gained 10-12 fps. (Tested it extensively before someone tells me it's placebo ) Amazing work to everyone involved. Well, if someone had too much time on their hands, I would be really thankful for PenAir livery that can be seen here: Thanks! DFS extension option, how much ram? 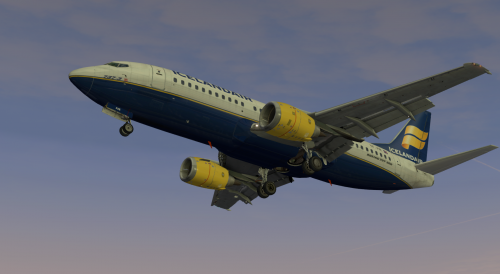 X-Plane is a 64bit software that can access all of your ram, given that your operating system is also 64bit and can access all the ram you have. Why are people so obssesed with the idea of a simmer flying a real life aircraft? Me and my cat recommend that livery for your children and the elderly. I want to fly with you too Jan, but only in A320! Ergo - a mystical force called gravity. Is the IXEG 733 too sensible in wind direction/speed changes ? Is that common across all weather engines? I thought sources like FSGRW or NOAA (to certain degree) handle wind generation on their own and override stock's X-Plane shenanigans. If I draw you a pretty picture in Paint, can we call it even and move on? But... I don't think it was ever meant to be a PROFESSIONAL COURSE video. It's just two folks talking about a plane, just a "first look at an addon X" type of thing. So, I see where you are coming from, but it's like taking a bite off an apple and saying it's nasty for not being a grape. I think the question was about the cockpit color "crispness". I don't think RTH can actually alter the color in that way. Probably custom color vibrance and what not. Haha, was it taken too lightly for your liking? Personally, I think it was great! No cold, mechanical voices telling me to flip that switch to get fuel pumps running. As I said previously it was not only informative but also a joy to listen to, becuase it sounded like two friends just bantering about some interesting topic with each other. I would love if they did a full course like they had with Q400, becuase it seems like a superb thing. So I would say that it's on the contrary, it was executed spot on.